During the plenary, several folks asked about the recent report that 2009 won't be seeing an American ad limina visit to Rome, which would normally be expected given the pilgrimage's traditional five-year timetable. In 2004 the U.S. bishops came on a pilgrimage to the tombs of Sts. Peter and Paul, to the "threshold of the apostles" -- "ad limina apostolorum" in Latin. But they will not be back in 2009 and not even in the first months of 2010, said Archbishop Francesco Monterisi, secretary of the Congregation for Bishops, which schedules and coordinates the visits. Things are backed up at the Vatican. "It is just not possible to preserve the five-year schedule," Archbishop Monterisi said, although he added that no one at the Vatican is talking about changing the written rules. The time lag, however, does allow the bishops wiggle room on writing what is still referred to as their "quinquennial reports." 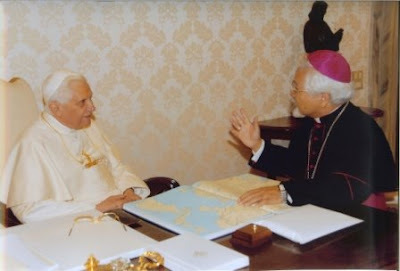 The Code of Canon Law says, "The diocesan bishop is bound to present a report to the supreme pontiff every five years concerning the state of the diocese committed to him." But the Vatican's directory for "ad limina" visits ties the report's deadline to the date of the bishop's appointment with the pope, saying it should be turned in "approximately six months, but not less than three months" before the scheduled visit. So, while the heads of Brazil's 252 dioceses spend most of 2009 and part of 2010 making their visits to Rome, the U.S. bishops will have an extra year to pull together diocesan statistics and information covering everything from Catholic schools to vocations, and from health care to ecumenical and interreligious initiatives. For the record, the canons provide that a bishop need not turn in a Quinquennial Report "if the year determined for submitting a report falls entirely or in part within the first two years of his governance of a diocese." The next visit will feature a new element for the Stateside bench; while, in the past, the heads of Eastern-church eparchies made the trip alongside their Latin-rite counterparts in the geography-based regions of the conference, the Oriental sees were recently melded into a USCCB region of their own, and so will now have their pilgrimage all together, with their own week carved out. While the bishops -- most of whom don't get to Rome as often as the A-listers -- love the visits, one complained earlier in the week that "those reports take so much time." To repeat an earlier word of advice: these days, they can't be meticulous enough. Regarding another prior note, the buzz has since gained further steam that the Congregation for Bishops has proposed raising the episcopal retirement age to 78. As with all things, the reported move remains under papal consideration.